The pro-PKK opposition Peoples' Democratic Party (HDP) lost significant cities in eastern and southeastern Turkey in the March 31 local elections on Sunday, slashing nearly two-thirds of its voter base in total as part of a strategy to not field candidates in other parts of the country. The HDP's nationwide vote, which stood at 4.24 percent, was almost identical to its predecessor Peace and Democracy Party's (BDP) 4.22 vote in 2014 local elections. However, the party fared significantly lower than its 11.7 percent and 8.4 percent vote in June 2018 parliamentary and presidential elections, respectively. The nationwide result for March 31 elections was also significantly lower than the HDP's votes in June and November 2015 general elections, in which the party received 13.12 and 10.76 percent of the votes, respectively. 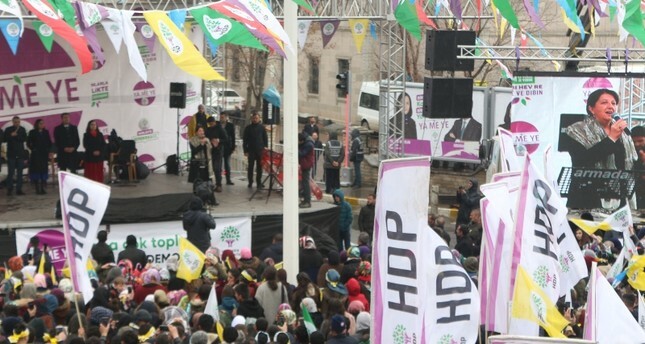 The ruling Justice and Development Party (AK Party) experienced a revival in eastern and southeastern provinces, clinching the municipalities of Bitlis, Şırnak and Ağrı province centers from the HDP. In Tunceli province center, the party lost to Communist Party of Turkey (TKP) candidate Mehmet Fatih Maçoğlu. In Şırnak, in addition to the province center, the AK Party also defeated the HDP in Uludere and Beytüşşebap districts. The HDP won Patnos district of the Ağrı province from the AK Party but lost Tutak to the Great Union Party (BBP). However, it maintained its majority in the provincial assembly with 45.15 percent of the votes. The AK Party won the province center with 55.6 percent of the votes. In Bitlis, the AK Party clinched the province center from the HDP with 43.87 percent of the votes, in addition to gaining Mutki district. The HDP also lost Hizan district to the SP. In Siirt, the HDP lost its lead in the provincial assembly to the AK Party, which won Eruh district from the HDP but also lost Kurtalan. The HDP won the metropolitan municipality race in Van with 53.73 percent of the votes, and gained Tuşba district from the AK Party. However, it lost the control of Bahçesaray, Çatak, Gürpınar and Saray districts to the AK Party. In Iğdır, the only province center that remained in the hands of the HDP after its mayors were removed from duty to their links with the PKK terrorist group, the HDP won with a slight margin but the results are expected to be challenged by the runner-up Nationalist Movement Party (MHP) candidate who ran for the People's Alliance. The HDP lost Tuzluca district to the SP. The HDP won the province center in northeastern Kars in a tightly contested race between four parties but lost the Digor district to the AK Party. It also lost Hınıs district in Erzurum province to the AK Party. In Muş province, the AK Party took over Malazgirt district from the HDP with a slim margin of three votes, while Karakoçan district of Elazığ province was won by the AK Party. In Şanlıurfa province, the HDP lost Bozova, Halfeti and Viranşehir districts to the AK Party, which won the metropolitan municipality with 60.82 percent of the votes. In Diyarbakır, the largest predominantly-Kurdish city in Turkey, the HDP increased its votes in the metropolitan municipality race from 55.07 percent in 2014 to 62.84 percent on March 31. The party lost Hani district to the AK Party. The HDP lost Artuklu, Dargeçit and Ömerli districts to the AK Party in Mardin province, where it won the metropolitan municipality election with 56.18 percent of the votes. In Batman, the HDP, which won the province center with 66.01 percent of the votes, gained Kozluk from the AK Party but lost Gercüş and Beşiri districts to the AK Party and the SP, respectively. The AK Party won Çukurca and Şemdinli districts from the HDP in Hakkari province, where the HDP's votes in the provincial assembly race dropped from 69.27 percent to 54.16 percent. As a result, Turkey removed the elected administrations of 93 municipalities in the region for their links to the PKK terrorist group and appointed trustees to these municipalities in 2016. In the trustee-run municipalities, damaged infrastructure for drinking water, wastewater and sanitation has been repaired and new infrastructure has been built, in addition to tens of thousands of housing to rehabilitate neighborhoods. Extensive construction work was undertaken by the trustees to revive the PKK-ravaged southeastern provinces. The Turkish government has long accused the HDP of close links with the PKK. The HDP is known for its support of autonomy in the regions where large Kurdish populations live. Also, some of its members have been charged or accused of having links to the terrorist organization. Its former co-leader, Selahattin Demirtaş, was arrested in November 2016 over terrorist propaganda. Formed in 1978, the PKK terrorist group has been fighting the Turkish government for an independent state. Its terror campaign has caused the deaths of more than 40,000 people including children, women and elderly people. The PKK is listed as a terrorist organization by Turkey, the U.S. and the EU.